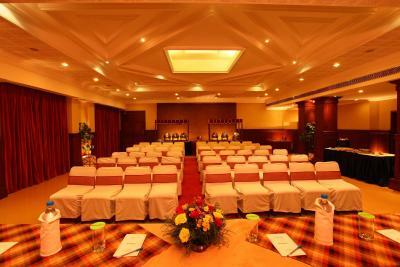 Lock in a great price for Sangam Hotel, Thanjavur – rated 8.5 by recent guests! Good location, clean and comfortable. Excellent Breakfast. Helpful staff members. Located near the railway station. Nice and clean. Plenty of car parking area. Excellent service. Nice garden. Good location. Clean, comfortable and quiet. Pleasant helpful staff, good selection of food at breakfast. The conceirge on arrival was fantastic and always said hello when he saw us around the hotel. Room was spacious and clean. Breakfast was nice with continental and Indian options. Very clean, courteous staff, excellent food. Good facilities for Drivers. Sangam Hotel, Thanjavur This rating is a reflection of how the property compares to the industry standard when it comes to price, facilities and services available. It's based on a self-evaluation by the property. Use this rating to help choose your stay! 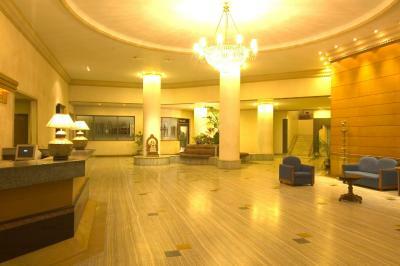 Sangam Hotel is 1,650 feet from Thanjavur Railway Station and 0.6 mi from Brahadeeshwara Temple. This property offers free parking, an outdoor swimming pool and 2 dining options. Elegant rooms are tastefully decorated with modern interiors and have large windows. 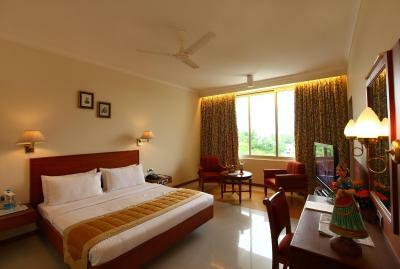 Each spacious room is well equipped with a TV, sofa and mini-bar. A shower and toiletries are standard. 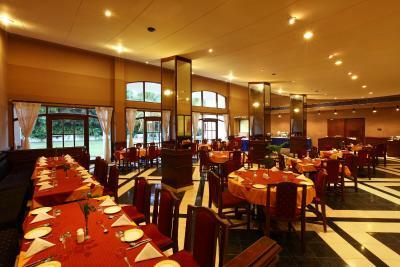 Guests can enjoy local and international dishes at Thillana Restaurant. 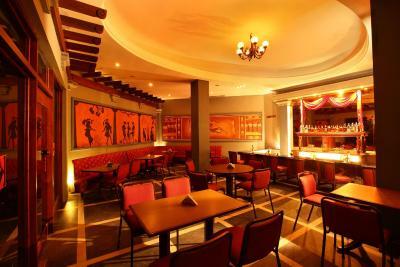 Layam Bar offers refreshing beverages and light snacks. Staff at the 24-hour front desk can assist with car rental and currency exchange services. Day trips and travel arrangements can be made at the tour desk. 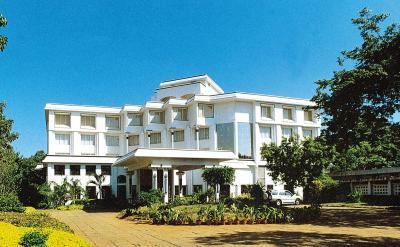 Sangam Hotel, Thanjavur is 1.2 mi from Thanjavur Royal Palace and 1.9 mi from Thanjavur Bus Stand. It is 12 mi from Chandran Temple and 14 mi from Garbharashambigai Temple. This property also has one of the top-rated locations in Thanjāvūr! Guests are happier about it compared to other properties in the area. This property is also rated for the best value in Thanjāvūr! Guests are getting more for their money when compared to other properties in this city. 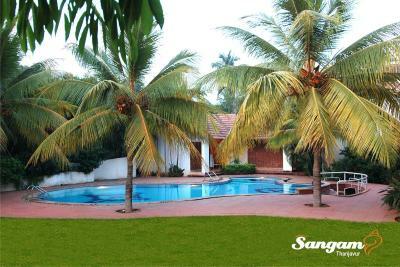 When would you like to stay at Sangam Hotel, Thanjavur? Air-conditioned room features a TV, sofa and bathroom. 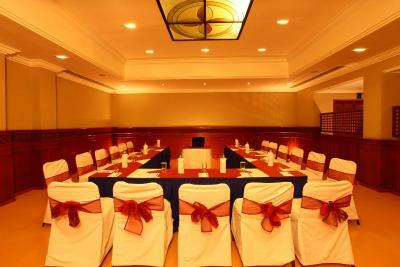 House Rules Sangam Hotel, Thanjavur takes special requests – add in the next step! 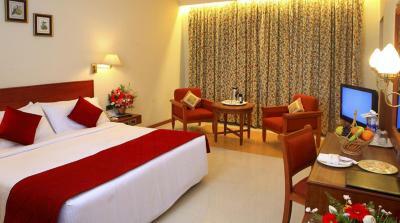 One older child or adult is charged INR 1200 per person per night in an extra bed. Sangam Hotel, Thanjavur accepts these cards and reserves the right to temporarily hold an amount prior to arrival. 30 minutes+ for checkin including keys not working. Service in restaurant slow. The stay was not comfortable. The billing persons charged us extra money as we came. They gave all reasons for the extra stay and billed us more. Not even a bottle of water was given extra for a whole day. we will not visit again. A member of hotel staff just watched as we tried to re-arrange beds by the pool. Restaurant staff were only seemed interested in getting us to order more things from the menu. Went to Krishna Bhavan restaurant up the road for dinner on our second night in Thanjavur and the staff and food there were amazing for a fraction of the cost. Food taste, quality and restaurant service are not good. The King Size bed is only Queen size.